The Vizio M422i-B1 is really geared up for the value TV shopper. At only $529.99, this TV turns out to be a very strong bargain in terms of screen space, picture quality, and smart TV features. The 2014 rendition of the M series has focused on upgrading picture quality and smart TV features. It is important to note that Vizio has ditched 3D playback in all M series models this year. It keeps the price down, but may not be good for those who have been building a 3D content library. Full-array backlighting is the star addition that has a direct effect on the overall picture quality. This bumps the contrast to levels that compete with some of the big name TV manufacturers. 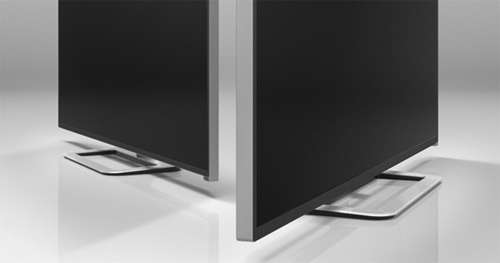 The 32 and 42 inch sizes in the M series have taken a hit in terms of Active LED zones, but that's the only difference. Vizio's internet apps plus provides access to all the streaming services you'll need as well as second screen abilities for smartphone and tablet integration. Black levels are more saturated than we saw last year, and the TV certainly has plenty of brightness in whites. Active Pixel Tuning helps even further by addressing contrast issues at the pixel level for stronger brights and darks. The Black Detail option is one that we found particularly useful in getting the best picture. We normally don't employ these image processing features since they introduce too many negative effects on the image. That isn't the case here are we recommend using it. In terms of sharpness, we've seen better from the big names like Sony and Samsung. This is a result of the picture processing engines and Vizio is certainly not among the worst. To further the 120Hz native refresh rate, Vizio includes a 720 Clear Action Rate feature. This backlight scanning feature will help with sports programming and fast action, but is better off left disabled most of the time. The M422i-B1 features active LED Local Dimming with 14 zones to enhance contrast control is one of the standout picture quality features of the M422i. As mentioned earlier, the smaller M series TVs only have 14 zones instead of the 32 zones on larger sizes. More zones are definitely better, but the smaller screen will make up for less zones as well. The Active LED Zones option in the Advanced Picture Settings controls this feature. We didn't see too much of a noticable difference with the feature on. This could be due to the low number of dimming zones. The overall picture quality of this TV will depend a lot on the picture mode you select. We thoguht Calibrated was the right choice to get the best out of the picture. The picture initally dims, but bumping up the backlight is key to getting the best balance between contrast and brightness in the image. Make sure the brightness setting is near 50% with the Contrast nearing 90%. There are a few other picture modes to choose from, but they either blow out the picture or are too dim. Other picture modes like Game or Computer are useful for cutting down the input lag or displaying video from a computer correctly. Vizio has added a Plus to the name of their smart TV features this year. 802.11n wifi is built into the TV for speedy connection capable of problem free HD streaming. 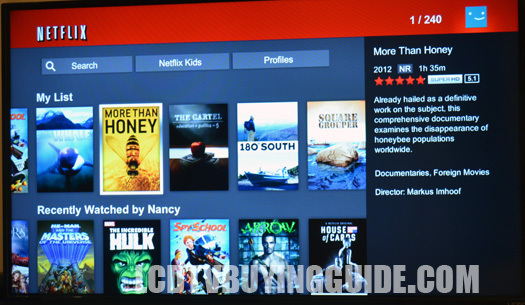 Some of the highlighted content streaming apps include Netflix, Hulu Plus, Amazon, Vudu, Pandora, and all the social media you'll need. The new backlit remote even has dedicated buttons for Netflix, Amazon, and M Go. The whole platform has recieved a redesign with HTML 5 in order to achieve an inuitive user interface. We think it is an improvement upon previous iterations. Second Screen interactivity is also a feature for iOS and Android devices. Compatible apps will be able to broadcast their content to the M422i's display without any wires. The M422i features a familiar design. We saw this look with the M series last year, but with one improvement. The bezels are thinner. The 8mm thin bezels really push the frameless look and are 20% thinner than last year's bezels. The base and neck are made out of metal to give it a solid construction and feel. The profile is razor thin and competes with the best LED TVs on the market. We thought the desing was average last year and that still stands, but thinner bezels are always a welcome addition. 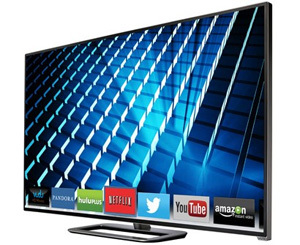 The Vizio M422i-B1 presents an excellent value for a full HD backlit LED TV with Smart TV features. It's a pretty solid package for value TV shoppers when you take a look at what you can get for a similar price from other TV manufacturers. The Samsung UN40H5500 has a similar feature set, but with 2 inches less of screen space and edge LEDs. Weight With Stand: 27.56 lbs. Weight Without Stand: 24.25 lbs.